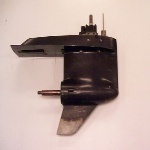 LAING'S OUTBOARDS has a huge inventory of used parts. All parts are fresh water, low hour parts. They are cleaned, inspected and fully guaranteed. 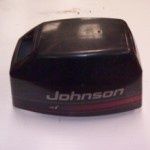 Our inventory is constantly changing, but below are some of the fast moving items. Why pay full price for new parts if you can get a quality used part at a much lower cost. If you have any questions, please submit the form at the bottom of the home page, or call our toll free number. All lower units are fresh water, low hour units. They are drained, inspected, pressured tested, re-sealed as needed and a new water pump impeller installed in most cases. Below is a general guide, Please call for your application or to order. 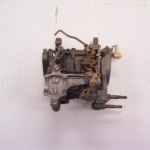 REBUILT CARBURETORS We stock many carburetors. They are disassembled, soaked, blown out then reassembled to specs with new parts. Price for many is $100. Or send us your carburetor and we will rebuild it. 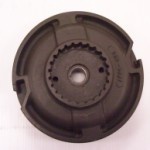 FLYWHEELS We have hundreds of flywheels in stock for every make of motor. They are cleaned and inspected. All have good tapers, keyways and magnets, at a fraction of the cost of a new one. STARTERS All starters are disassedmbled, cleaned, bushings lubed, and bench tested for proper RPM's. 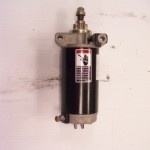 You are often better off with a used OEM starter than a cheap import as sold on the internet. 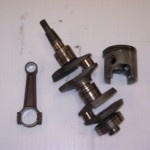 CRANKSHAFTS, RODS, PISTONS and other powerhead parts. 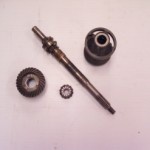 Parts are carefully inspected and micd for tolerance, at a much lower cost than new. to bring your tired looking motor back to life. 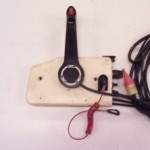 CONTROLS, CABLES, HARNESSES and all the other parts and pieces to make your motor operational.